Context: Incorporation of educational measures which enhance well-being is one of the priority needs of mainstream education in the 21st century. Yoga nidra is an ancient Indian practice which enhances well-being through the release of stress on physical, emotional, and mental planes of one's being through the creation of an experiential state of inner awareness with simultaneous detachment. Aim: The aim of the study was to assess qualitative effects of yoga nidra on physical, emotional, cognitive, and spiritual dimensions of well-being in trainee teachers. Materials and Methods: Seventy-seven students received yoga nidra sessions over for 3 months. About 86% of students (n = 66) submitted their diary notes containing their observations and experiences about yoga nidra sessions, which were thematically analyzed. Results: Key observations captured from 475 individual observation notes were experience of quietude, freshness, and relief from fatigue, clarity of thoughts, enhanced concentration, memory and reduction of anxiety, depression, and worries. As the weeks of the study progressed, the transformative effects of yoga nidra were noticed in the forms of enhanced capacity for self-reflection, self-awareness, and behavioral modification. Conclusion: Yoga nidra sessions enhance hedonic and eudemonic dimensions of well-being through minimizing negative emotions such as stress and anxiety, enhancing positive emotions such as happiness, enthusiasm, and alertness, and bringing about an experience of cognitive, emotional and behavioral stability, and clarity. It can be considered as a useful tool for enhancing well-being. Positive education is defined as education for both traditional skills and happiness. High prevalence of depression among young people, small rise in life satisfaction, and synergy between learning and positive emotion indicate the need for teaching skills for happiness in school. Trainee teachers, the ambassadors for this educational innovation, however, suffer from higher levels of stress arising from psychological and/or physiological imbalances. Engaging individuals in specific forms of training through psychotherapy, meditation has been shown to enhance well-being through functional and structural changes in the brain. Yoga is an ancient, comprehensive life discipline useful in harmonizing body, mind, and spirit helpful in enhancing well-being and transcend suffering by developing an abiding awareness of one's spiritual nature. It enables the growth of oneself from the phenomenal to the real man. Yoga nidra is a part of Sense withdrawal or pratyahara technique of Yoga which facilitates a state of inner awareness and outer detachment brought about through a systematic and largely scripted process of guided relaxation. Beneficial effects of yoga nidra have been documented in clinical and educational cohorts; however, there is dearth of elaborate qualitative studies. The quintessential effects of yoga nidra practice cover cognitive, emotional, and spiritual dimensions of well-being, the measurement of which can be complete only by including objectively measurable phenomena as well as subjective and experiential effects. We, therefore, chose the experiential, subjective narratives for data collection during this arm of the study to study its qualitative effects. We set out to study effects of yoga nidra on physical, emotional, cognitive, and spiritual dimensions of well-being among trainee teacher (B. Ed. or Bachelor of Education) students of faculty of education in a rural-based university in central Gujarat, India. Approval was taken from the Institutional Ethics Committee (letter no IEC/HMPCMCE/2017/17). Participants were enrolled after obtaining voluntary informed consent. All students had completed their graduation/postgraduation studies in various disciplines of humanities or science. They had been exposed to conventional yogasana (physical postures) but not to yoga nidra prior to the study (except one student, who was familiar with Yoga nidra). Participants did not take part in any other yoga practice during this intervention. Seventy-seven students who volunteered to participate in the study were enrolled. Preexisting acute or chronic illness or development of acute illness during the study constituted the exclusion criteria. There were no dropouts. Yoga nidra sessions were conducted for 45 min/day once in a week by instructors who were clinicians in a medical college and had 3 years' experience of conducting yoga nidra sessions. Each session comprised of guided yoga nidra practice performed in a relaxed state in supine position of “shavasana,” wherein participants followed spoken instructions of the instructor to undergo sequential stages of resolve, rotation of consciousness, breath awareness, and visualization. After 8 weeks, students had a preparation time of 3 weeks for their semester examinations, so they were given audio recording of the guided yoga nidra session and were asked to continue the same. Participants found audio recording were equally effective as compared to sessions conducted in person although the detailed record of self-practice compliance has not been maintained. The guided sessions were resumed on completion of examinations. Total number of guided group practice sessions before and after examinations were 12 and 7, respectively. The research question was: what are the effects of yoga nidra on multiple dimensions of well-being in teacher trainees? Diaries maintained by the participants were considered the most appropriate mode of qualitative data collection since we aimed at capturing the first-person experiences, perceptions, attitudes, and behaviors over a period of time. Participants were briefed about the focus of the study and provided a simple framework prior to the commencement of the study. Participants were asked to give open-ended comment on their experiences during yoga nidra practice. During the initial couple of sessions, they were asked to record a brief report describing whatever aspect of their practice experience and its effect which seemed most important to them at that moment. Subsequently, they were asked to pen down their experiences after reflecting upon the sessions at their convenience later in the week. Diary recordings were unsupervised and were in the form of free expressive format. Diaries were transcribed by one researcher and rechecked by the second researcher. No diaries were found to be illegible. Thematic analysis of the data was carried out based on the grounded theory of analysis. While doing so, the observation notes were read multiple times in conjunction and key concepts noted. The researchers familiarized themselves with the data, identifying text that was relevant to the research question. The themes were honed, through discussion, until consensus between the authors was reached - this was an iterative process which distilled and refined in a cyclical fashion. In the end stages, notes were revisited to check whether the honed themes reflected the key messages recorded. In the presentation of findings, illustrative quotes from participants' narratives are used. The key concepts identified in the narrative diary records were that yoga nidra produces an experience of physical well-being, emotional happiness and quietude, and, cognitive well-being in the forms of clarity of ideas and thinking process. Both the researchers concurred with the concepts identified since reflective narratives were almost equivocal in the describing the core experiences. Additional instruments and quantitative measurements: In addition to qualitative observations, pre- and post-interventions effects of yoga nidra were objectively assessed through several standard tools, namely (1) faces scale for happiness (Happiness), (2) visual analog scale (Perceived Stress), (3) ladder scale (Cantril's Self-Anchoring ladder (Overall Quality of Life), (4) Psychological General Well Being Index-Short (PGWBI-Short) (Psychological General Well-being), (5) Rosenberg self-esteem test (Self-esteem: measured), (6) Perceived Stress Scale (Stress), and (7) SISRI 24 inventory (Spiritual Intelligence). However, results of the same and their comparative analysis are not included in this paper in view of enormity of data, derivations and determinative implications although they too concurred with results of qualitative analysis. Seventy-seven students (56 females [72.73%] and 21 males [27.27%]) in their early twenties (mean ± standard deviation: 22.44 years ±1.79). There were no dropouts. Participants enjoyed the yoga nidra sessions, and no adverse effects of yoga nidra practice were reported. “Freshness and rest resulting from half an hour of yoga nidra are far more energizing than hours of normal sleep,” observed one participant. About 35% of participants mentioned “they could focus well on learning during the study. Participants felt relaxed and comfortable during the examination” “This was a different experience for taking examinations” – 15 participants mentioned! These accounts capture participants' journeys through the process of practicing yoga nidra over a period of 3 months. As these accounts suggest, nearly all participants considered yoga nidra beneficial in terms of helping them to cope with the emotional and cognitive disturbances and in enhancing well-being. Yoga nidra is a part of pratyahara technique of yoga which facilitates a state of inner awareness and outer detachment brought about through a systematic and largely scripted process of guided relaxation. It has been suggested that yoga nidra has potential to enhance well-being and self-development, improve memory, increase in knowledge and creativity, and transform one's nature. We observed that with increasing duration of the study, there was a transformative effect on thinking process from superficial to deep level, from explicit to implicit. This led to growing positive intrapersonal, interpersonal, and transpersonal effects. Intervention was seen by the participants as tool to modify their nature. We attribute these changes to progressive increment in the depth of experience of yoga nidra and its widening influence on one's being. Pioneering studies by Kamakhya K, have shown that the practice of yoga nidra is helpful in awakening inherent creativity, enhancing well-being and promote learning and memory abilities of the practitioner. Positive effects of yoga nidra on hedonic well-being has been reported in several studies including a study on adolescents carried out by us and in college students by Kamakhya and Kim., Our present observations additionally point toward the emergence of positive, nobler qualities in one's personality as a result of yoga nidra. This prompted us to pursue an additional analytical step wherein we have attempted to explore whether the emergent theory discovered in the first phase of analysis was related to ancient/esoteric and modern theories hypothesizing mechanisms which enhance well-being, and if so, how. For all its basis and method, as well as for its purpose and authenticity, yoga nidra draws heavily from ancient Indian texts. While the observed results are often assumed to be indicative of “the effects of yoga nidra,” the focus on positive health-related benefits represents only a narrow selection of possible effects that have been acknowledged within the ancient scriptures, which far exceeds the “mundane” objectives. Nevertheless, attempt to contextualize its application in reference of positive psychology do offer a basis for constructing an integrating framework for interventions in positive psychology. In parlance of ancient Indian psychology, well-being refers to awareness and manifestation of a transcendental state of consciousness, which human beings are capable of accessing. Yoga is the science, the process, the effort and action by which man attempts to pass out of the limits of his ordinary mental consciousness into a greater spiritual consciousness, from the phenomenal to the real man. The four powers and objects of yoga are purity, liberty, beatitude, and perfection, which too can be cultivated and attained through methodical self-development, which ultimately foster attainment of the highest level of well-being. In this context, yoga nidra is a method of awakening oneself to the influence of one's “psychic consciousness,” which has been described as a plane of consciousness which is endowed with a sense of happiness, peace, calmness, contentedness, and bliss. Detailed elucidation of the effects of yoga nidra is beyond scope of this paper. Briefly, the stage of Shavasana helps in physical and mental relaxation. Stage of resolve enhances self-determination. The rotation of consciousness helps in bringing about a state of simultaneous relaxation and awareness, thereby helping in producing a witness state of consciousness. This is an ideal state of mind to plant a thought or willed resolution in oneself. The effects of “visualisation” have been described as useful in shaking off painful memories, conflicts, fears; in other words, fostering neuroplasticity which “rewires” the neural pathways. In its totality, the process facilitates the integration of learning that goes from implicit to explicit knowledge (bottom-up knowledge) with learning that goes from explicit to implicit knowledge (top-down knowledge) for improved self-regulation and self-modulation. Marti A and Sala J in their extensive long term studies on 'enhancing awareness' have concluded that yoganidra brings about release of stress on all planes of one's being leading to improvement in cognitive, emotional, and behavioral well-being. Yoga nidra produces alpha dominance in both hemispheres more consistently and for more duration as compared to other relaxation practices. Yoga nidra enhances self-awareness through binding conscious experiences together in a single construct with a sense of unity of consciousness as reported by Hans C. Lou et al. In the parlance of modern psychology, sustained positive emotion, recovery from negative emotion, empathy, altruism, mindfulness, and emotion captured attention are novel constituents of well-being. The neural circuits that underlie each of these constituents overlap partially thus can be transformed through experience and training. There are several unique aspects of this study. Effects of a process as profound as yoga nidra cannot be studied on a fewer dimensions of well-being through objective tools alone. We used qualitative methods for the evaluation of multiple dimensions of well-being recorded week after week to document its beneficial effects We also verified that there was congruity between qualitative and quantitative analysis, although the latter is not presented here. We chose trainee teachers because we believed them to be more proficient in principles of reflective learning about a process which is essentially experiential. The depth of observations captured during the study validated our selection. Literature on the pedagogy of mindfulness-based approaches has placed considerable emphasis on the importance of the teacher embodying the spirit and essence of the well-being enhancing practices taught. Teacher's professional identity and personality are strengthened during their teacher training course; and therefore, it is an opportune moment to provide an input which focuses on one of the priority areas of educational goals. Results of our study demonstrate that conducting regular yoga nidra sessions in trainee teachers enhances hedonic and eudemonic dimensions of well-being through minimizing negative emotions such as anxiety, enhancing positive emotions such as happiness, enthusiasm, quietude, and alertness, and bringing about a clarity and stability of thinking process and aligning individual and societal goals. Yoga nidra can be considered as a useful tool for enhancing well-being. It is indeed a high time to incorporate wellness education into mainstream education. After all, what is a true and living education? - “That alone will be a true and living education which helps to bring out to full advantage, makes ready for the full purpose and scope of human life all that is in the individual man.” (Sri Aurobindo). The authors would like to acknowledge the authorities and the staff of the college of education where the study was conducted. Seligman M, Ernst R, Gillham J, Reivich K, Linkins M. Positive education: Positive psychology and classroom interventions. Oxford Rev Educ 2009;35:293-311. Soureche R. A study of stress level among B. Ed. students. Int J Teach Educ Res 2015;4:15-20. Davidson RJ, McEwen BS. Social influences on neuroplasticity: Stress and interventions to promote well-being. Nat Neurosci 2012;15:689-95. Singh G, Singh J. Yoga Nidra: A deep mental relaxation approach. Br J Sports Med 2010;44 Suppl 1:i71-2. Satyananda SS. Yoga Nidra. India: Bihar Yoga Bharati Yoga Publication Trust; 2006. Muraleedharan T. Stress in relation to teaching aptitude of student teachers in colleges of education. Int J Adv Res Educ Technol 2015;2:95-101. Rehmani N, Khan QA, Fatima SS. Stress, anxiety and depression in students of a private medical school in Karachi, Pakistan. Pak J Med Sci 2018;34:696-701. January J, Madhombiro M, Chipamaunga S, Ray S, Chingono A, Abas M. Prevalence of depression and anxiety among undergraduate university students in low- and middle-income countries: A systematic review protocol. Syst Rev 2018;7:57. Gates M. Advancing the adolescent health agenda. Lancet 2016;387:2358-9. Kapteyn A, Lee J, Tassot C, Vonkova H, Zamarro G. Dimensions of subjective well-being. Soc Indic Res 2015;123:625-60. Berridge KC, Kringelbach ML. Building a neuroscience of pleasure and well-being. 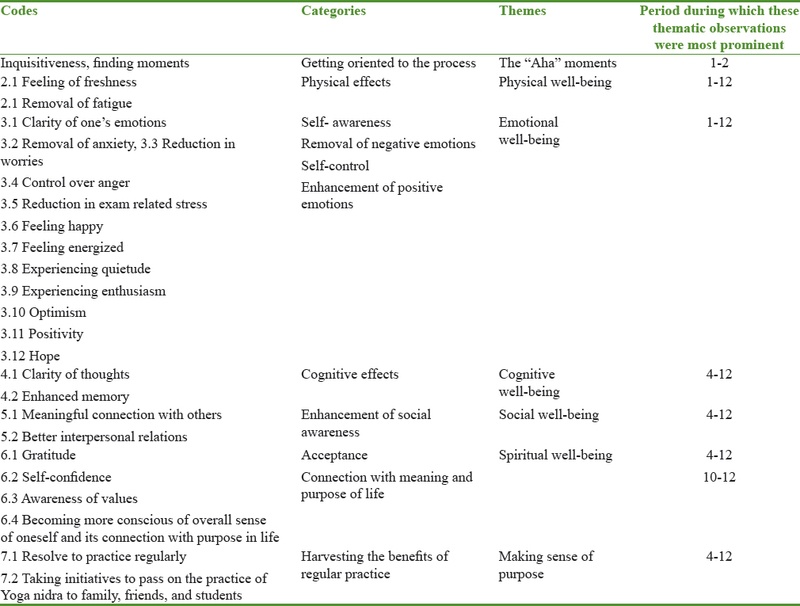 Psychol Well Being 2011;1:1-3. Kamakhya K. A study on the impact on stress and anxiety through Yoga Nidra. Indian J Tradit Knowl 2008;7:4014. Vaishnav BS, Vaishnav SB, Vaishnav VS, Varma JR. Effect of yoga-nidra on adolescents well-being: A mixed method study. Int J Yoga 2018;11:245-8. Kim SD. Effects of yogic exercises on life stress and blood glucose levels in nursing students. J Phys Ther Sci 2014;26:2003-6. Sri Aurobindo S. The Life Divine, the Complete Works of Sri Aurobindo. Pondicherry: Sri Aurobindo Ashram Publication Department; 1997. Marti A, Sala J. Awareness Through Body. Auroville: Sri Aurobindo International Institute of Educational Research; 2006. Barnes VA, Bauza LB, Treiber FA. Impact of stress reduction on negative school behavior in adolescents. Health Qual Life Outcomes 2003;1:10. Lou HC. Self-awareness – An emerging field in neurobiology. Acta Paediatr 2015;104:121-2. Helliwell J, Layard R, Sachs J. World Happiness Report 2013. New York: Sustainable Development Solutions Network; 2013. Crane RS, Kuyken W, Hastings RP, Rothwell N, Williams JM. Training teachers to deliver mindfulness-based interventions: Learning from the UK experience. Mindfulness (N Y) 2010;1:74-86. Sri Aurobindo. The Complete Works of Sri Aurobindo. Pondicherry: Sri Aurobindo Ashram Publication Department; 1997.